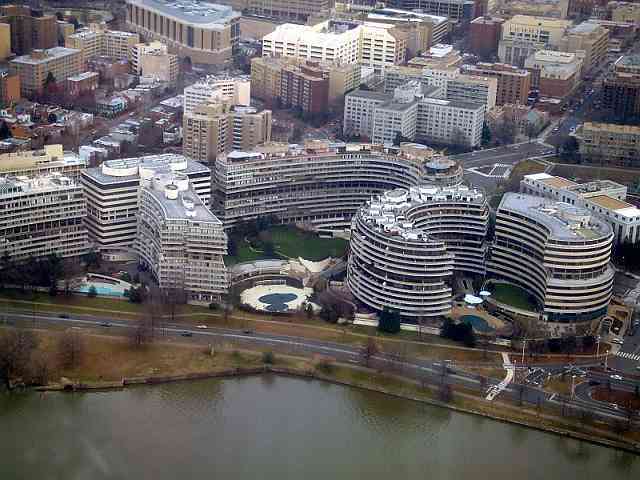 If it weren’t for the “third-rate burglary” Watergate would likely only be known as a desirable address in Washington, DC and the headquarters of a prostitution ring in the early 70’s. This picture is in the public domain and provided by its author Indutiomarus. But then the bizarre paranoia and arrogance of a president and his followers changed all that. They attempted to stage a coup which resulted in the one of the gravest constitutional challenges in American history, right up there with Dan Shay’s Rebellion and the Civil War. The ultimate battle pitted the Congress with it’s impeachment proceedings and the Supreme Court in the United States v. Richard Nixon on one side with the president claiming that the office of the president could do whatever it wanted under the guise of executive privilege on the other. The events that resulted in the first resignation of a US president and years of drift as Americans tried to figure out what had happened coincided with North Vietnam crushing the South, the Soviets appearing as the more dynamic superpower, America’s economic strength looking as it might not recover from high inflation and unemployment. Client wars and uprisings in Latin America and Africa. It looked for a time that America had lost it’s way. For one Canadian kid who should have been outside playing road hockey or baseball, the theatre of Watergate in the summer of 1974 was a very powerful lure. Pretty much no one, including the American media, paid any attention to the Watergate break-in in the short-term. Bob Woodward and Carl Bernstein’s first article about the burglars having bugs didn’t lead to much, but they continued to publish articles on it. The tide of opinion and the polarization of the event really took off with the Woodward and Bernstein article on October 10 1972 describing what the FBI believed: Nixon re-election team members had been breaking the law to destroy the Democrat presidential campaign. Although it took many more months to understand what had happened and who knew what, the reporting, criminal cases and other hearings led to the House of Representatives authorizing the House Judiciary Committee to begin impeachment investigations. Why was this more exciting to a certain 11 year old then playing outside? My older sister remarked just this morning that I always preferred the news to anything else on tv. Like many folks watching coverage of Vietnam on the nightly news, tv was an increasingly important part of reporting. It was more timely and more visceral. Yes, I had a very precocious interest in the bigger world. At the heart of it, though, was the drama and how it connected to everyday life. Our parents told us not to steal, lie or cheat. Yet everyday more stories came out about how it appeared the most powerful person on the planet (as we then saw it) might be doing some of those things we were not allowed to. Nixon was acting just like a kid my age might do when confronted about cheating: deny, misdirect, blame someone else. And in watching the Judiciary committee discussions and hearings here was a classic battle, the stuff of a mythic battle. This will make me sound really precocious, but always in the back of my mind was one simple question. Why would he risk it? Here was a guy with a great origin story: growing up poor, fighting in World War 2, becoming a lawyer, being elected a Congressman so young and being catapulted into the vice-presidency. Even in losing out to Kennedy in 1960, he kept fighting. I don’t want to suggest that I agreed with his politics, but he had it all. He had lived the American Dream and persevered to make it come true. Despite all the revelations that come later about Nixon, his White House, the corrupt and personal use of government agencies like the FBI, the CIA and the IRS, one thing was never revealed. We just have no idea why Nixon thought the ‘dirty tricks’ or, more correctly, the employment of a secret group of Janissaries to compromise constitutionally guaranteed rights was more important than upholding the Constitution and making moral choices. The proof that Nixon not only authorized the cover-up but was aware and consented to the illegal activities is abundant. It is in his own words. After 40 years, there are few details we don’t know except for one and that one is huge. Why did he do it? Any new book or article on Watergate gets my immediate attention because the motive is the only real mystery. Was Nixon an example of an America that had lost it’s way as a shining light of democracy or was he and his henchmen an aberration. Two of my favourite books about the time are Stanley Kutler’s The Wars of Watergate and Woodward and Bernstein’s The Final Days. Both are great chronicles of the time with Kutler’s being the superior catalog, I feel. The Final Days humanizes Nixon to a great degree, but there is no answer to the question of why in those books. Of the movies that are connected to Watergate and Nixon, the one that I find most satisfying in Watchmen. I had not read the graphic novel. I was probably the only one among my peers who had not. Seeing the movie was an unexpected pleasure for the Watergate geek in me. When the Comedian says it’s like Woodward and Bernstein all over again while shooting at protesters during a police strike, maybe there is a clue there. Had the American Dream come true and for some that meant anything goes. The only thing left was to exercise unlimited, unfettered power. Nixon was a person who had it all and was transforming America. Why did he do it? For a kid who was transfixed by the drama of the summer of 1974, that question powers my continuing interest in that low point in American history. Jim, I’m a couple of years older but was equally fascinated at an almost equally precocious age. My grandparents (lifelong Democrats) had voted for Nixon and I was just stunned by how rotten and corrupt the whole thing was. It altered my political thinking. I’m not sure Americans really learned the lesson – lying and denying still play a pretty big part in the U.S. scene. Surely I am older than you, David. I can’t imagine how someone who would have voted Democrat, but voted for Nixon over Humphrey and McGovern would have been thinking about that choice in ’74. I am not sure Americans didn’t learn or haven’t remember a lot from Watergate. Unfortunately, many things that would have been unthinkable under Nixon became ordinary under Bush and Obama. I saw a quote from John Dean over the weekend that Nixon would not have order torture. What Dean forgets is what Nixon approved for Laos and Cambodia, but there may be a kernel of truth in what he says about torturing individuals. When I think about the lessons we have forgotten or failed to learn I think of our own Prime Minister and him rolling back access to information and political financing, as well as making officers of Parliament report to his office first rather than directly to Parliament. I also worry that having the CRA look at environment charities is a little too familiar to someone like Nixon using the IRS to intimidate Americans.